You will agree with me that protection is the most essential feature of a boonie hat. However, if it cannot safeguard your face and neck against the sun, then it is basically useless, and that is why we have carefully taken our time to review some of the best boonie hat models available on the market. As you might have noticed, these had become a must have for hikers and hunters alike. But, this is not just a sun hat. It can also provide protection from the most weather conditions, like rain, wind or snow. These hats protect the head and the face and are primarily made for people that wish to skip applying sunscreen every hour. Also worth mentioning is that all Boonie hats are one-size fits most, and mostly come with an adjustable strap that holds it on your head and it keeps it from getting blown away by the strong winds. Now that we got that out of the way, let’s take a look at some features you need to consider before buying the perfect hat for your needs and then we can move on to the reviews of some of the best models on the market. There are many characteristics and features that can be found in a Boonie hat, which cannot be found anywhere else. Consider the tips below as important ones before buying one for you. In the first place, one of the main reasons why we want to buy a Boonie Hat is for UV protection. The sun’s rays can damage the skin over time. It can also cause spots, skin diseases, and other unwanted skin related issues. Yeah, it’s true, there are sunscreen sprays or lotions that are meant for that purpose, but they tend to disappear in time and you have to regularly reapply them. 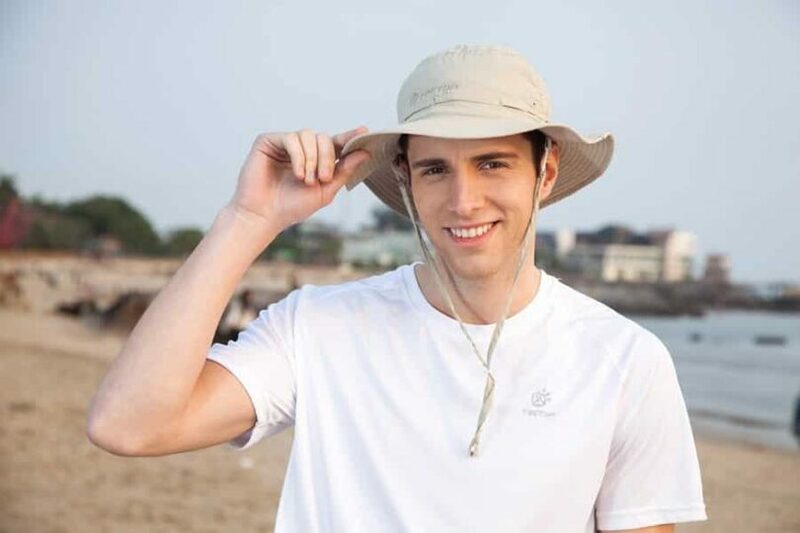 One of the best ways to protect our skin is with UV protective clothes, for example, an outdoor hat. They usually range from 30 to 65 ratings; the higher the UPF protection, the better UV protection to our skin. This is very important! A hat that is highly durable will fold back into place after being crushed. Crushing them with our bare hands is one way of testing its durability. If the hat gets destroyed easily or will have holes or torn up spots, surely, it is not durable. We tend to spend a good amount of money on items so we could get something durable that will last for a long time. Since these hats are going to be used outdoors, and they will go through a lot of tests from the environment and weather, always make sure that they are very durable and made of strong materials. Always keep in mind that the comfort is one of the most important factors you need to consider. 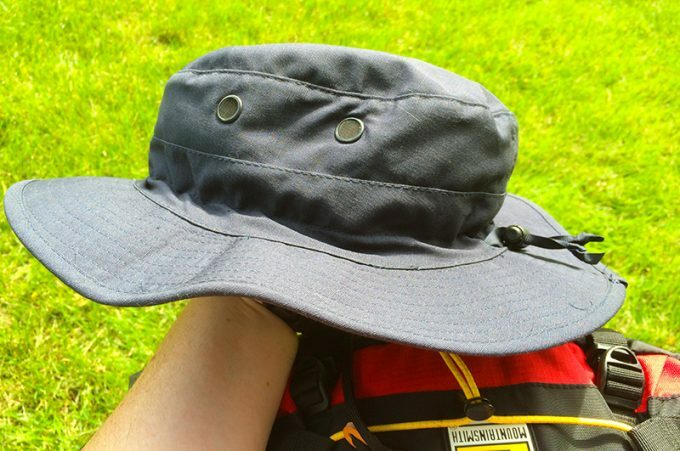 In the case you plan on wearing the hat for the whole hiking trip, which can sometimes last for a couple of days, if you feel uncomfortable while wearing it, it is useless. You will be simply wasting your money if you pick the item that is uncomfortable. There is no doubt that breathability is a very important feature, especially when worn out during daytime. You are definitely going to sweat, since the heat and the exercise are enough to make our body produce a lot of sweat to cool us off. If the Boonie hat that you bought is not breathable, the sweat is going to accumulate inside it and this can cause a bad smell to occur, as well as make your hair look pretty messy. Therefore, we need to allow sweat to evaporate or be released rather than be trapped inside the hat. To avoid unnecessary odor, always make sure that the hat you purchased is breathable enough. 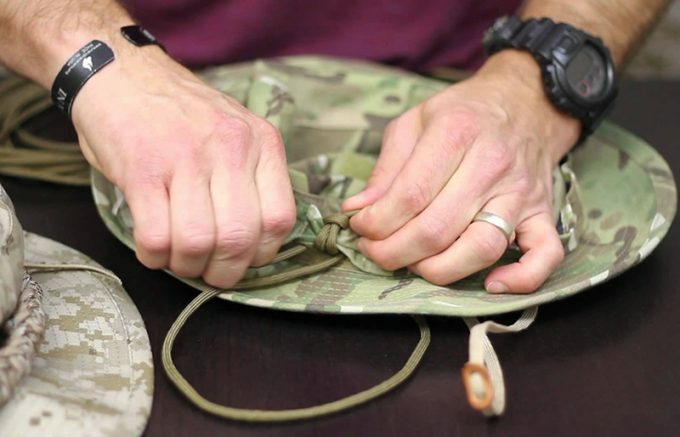 Picking a Boonie hat can be quite difficult, especially if you are getting it for the first time. Below are our suggestions for the best boonies available. So check them out and make your choice! Specific features: Omni-Shade UPF 50 sun protection, skin cancer foundation’s seal, 100% nylon, omni-wick sweatband with mesh vent panel, quick-dry properties, adjustable toggle, adjustable chin strap. Description: The Columbia Bora Bora Booney is made of 100% Nylon which is made with synthetic polymers. Nylon was intended to be a synthetic replacement for silk. This hat model, is made with Omni-Shade UPF 50 Sun Protection and is carrying a Skin Cancer Foundation’s seal. Omni-Shade is a sun protection apparel technology that was designed to help prevent harmful UVA (Ultraviolet-A) and UVB (Ultraviolet-B) rays from passing through a garment and reaching your skin. This kind of clothing helps you being protected from the sun damage as you enjoy the outdoors. An UPF 50 (Ultraviolet Protection Factor) indicates an excellent sun protection. This allows 1/50th (about 2 percent) of the ultraviolet radiation from the sun to pass through to your skin. The higher the UPF number, the lesser light reaches to your skin. The Skin Cancer Foundation’s seal can only be earned by those manufacturers that provide scientific data showing that their product sufficiently and safely aids in the prevention of sun-induced damage to the skin. It has been reviewed by a Volunteer Committee of Photobiologists (experts in the study of the interaction between ultraviolet radiation and the skin). This Boonie Hat is made with an Omni-Wick ™ sweatband combined with mesh vent panel (non UPF) that wicks moisture to help keep you cool and the sweat from dripping in your eyes. Furthermore, it has an adjustable toggle, which customizes the hat’s fit to your head. It also comes with an adjustable chin strap that adds further security against loss in the wind or bush. Also worth mentioning is that this model is suitable for both men and women. It comes in multiple colors to suit whatever gear you have. Furthermore, it has a sturdy body, complemented with a durable chin strap. While not waterproof, the quick dry properties of the material will allow it to dry quickly. Best of all, it is a one size fits with an adjustable toggle. Related: if you have bought a boonie hat, but it is too large for you, with this Hat Size Reducer, you can now get a great fit! Description: The Rothco Military Boonie is made of 100% Polyester, which is lightweight and made with highly durable synthetic fabric that shares many properties, such as; easy care, wrinkle resistant, stretch resistance, and shrink resistance. Furthermore, polyester is also a fast drying fabric, making it easier to dye, heat resistant and abrasion resistant. This Boonie hat features 4 screened side vent holes that allow heat to escape easier, directly out through the holes, and air to pass through smoothly. The screened vents also prevent the water from coming in. Another thing, it has an adjustable chin strap that keeps the wind from blowing the hat away from your head. Surely, your hat will stay on your head the entire time. Moreover, this hat is very functional as well as fashionable. It was made to fit government specifications, as this is the foremost supplier of military, tactical, outdoor, survival clothing as well as gear. Related: The manufacturer of this boonie hat also produces the Rothco Long Sleeve T-Shirt. This shirt is a perfect match to wear along with your boonie hat since it comes with the same camo design and offers protection from the sun. Description: The Lethmik Boonie is designed and made of Polyester – Cotton Fiber. Cotton-Polyester blends (Polycotton) can be strong, wrinkle and tear resistant, and reduce shrinking. 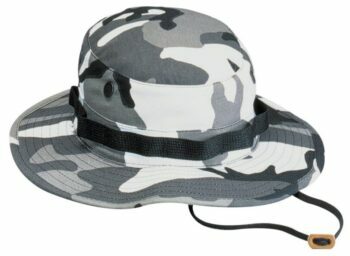 This Camouflage hat has UPF 50+ Sun Protection, which provides the excellent protection from UV (ultraviolet) radiation and has the highest possible rating. It also protects your neck and face against the sun’s heat. Therefore, this hat is great for any outdoor activities. The hat fits most adult’s sizes (7 ¼-7 5/8 (22 ¾-24 inches), and it’s equipped with an adjustable wind rope, which holds the hat in place on windy days. This adjustable chin drawstring is very practical and has a classic decoration. Additionally, it has a wide brim that can be kept down or folded in different styles, depending on the coverage from the sun you are looking for. Furthermore, it can be carried easily inside the bag or in a pocket, as it is foldable and crushable. Related: if you want a good cleaning brush for your boonie hat, then you can check out the Fedora Cap Brush. If your boonie gets wet, get rid of all moisture, let it dry, and then gently use the brush to clean it. 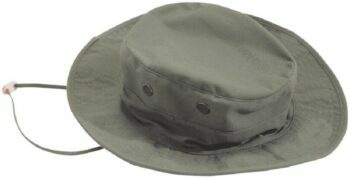 Description: The JL Depot Military Jungle Hat is made from canvas material which means that this model is extremely durable and gives excellent sun protection. It was designed to protect the head from the sun and from the sand. This Camouflage hat has 4 ventilation holes that keep the hat ventilated. It also allows heat to escape easier and directly through the holes, and prevents water from entering. Furthermore, it is designed with an adjustable strap that will keep it getting blown away by the wind, so there is no fear of loosing your hat it the conditions become windy. This boonie hat is really versatile and lightweight. It is well designed and very affordable. The hat enables your head to breathe well while giving protection against the sun. This boonie hat looks great and works great. Great item. 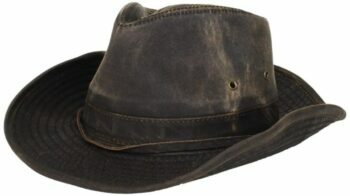 It features a chin strap with a rope bolt, which enables you to tighten down the hat, and prevent it from tumbling off. This boonie hat has a customizable drawstring that provides it with the correct stability. 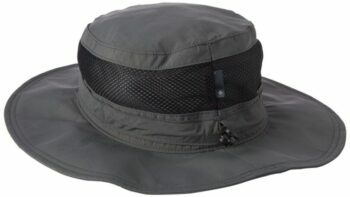 This boonie hat is really a great plus to any outdoorsmen’s gear, and indeed one of the great boonie hats for the cash. Related: Does your new boonie hat just not fit correctly? 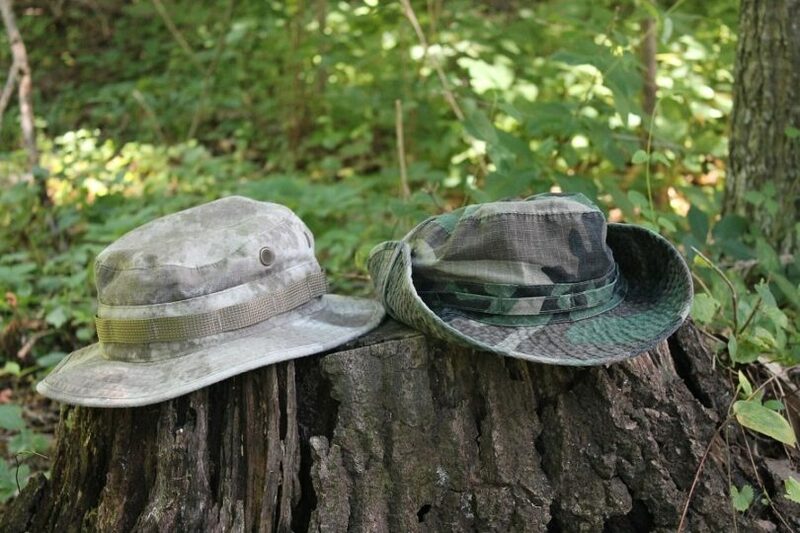 Do you have any boonie hats that have shrunk after some time? The FirstChoice Hat Stretcher will tackle each one of those issues! Description: The Dorfman Pacific Weathered Hat is made of Weathered Cotton, which represents a blend of cotton and polyester. The great advantage of cotton is that it is extremely soft and highly durable, and usually will last much longer. The hat is designed to keep you comfortable during summer months. Also worth mentioning is that this model has the UPF 50+ Sun Protection, which provides the excellent protection against UV (ultraviolet) radiation. It also protects your face and neck from the heat of the sun. This is really one of the best choices for any outdoor activity and sports. Furthermore, it features contoured crown with ventilating ports that allows the heat to escape easier, and air to pass through smoothly, providing excellent ventilation. 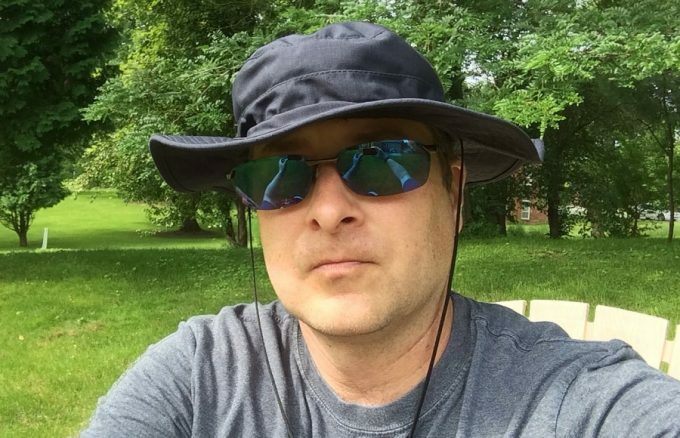 Additionally, this hat is water resistant and is looking similar to oilskin and leather hats, and is highly durable and nearly indestructible. The shapeable brim proves to be more of a gift than a curse, as it allows the hat to shape easily, and retains it for a decent period. It cannot be washed in a washing machine because the color will fade out. Related: Do you need a sponge cleaner for cleaning the surface spots on your boonie hat? If yes, then you can check out the Bickmore Sponge Hat Cleaner. Easily wipes out grime, dust and dirt. Specific features: 100% cotton, brass screen vents, adjustable chin strap, built in internal map pocket, loops around the crown. Description: The Tru-Spec Military Boonie is made of 100% Cotton that is designed to keep you comfortable during summer months. One of cottons greatest advantages is that it provides great comfort, is very soft and durable at the same time, and it lasts quite long. Furthermore, this Boonie hat is designed with brass screen vents for ventilation, complemented with an adjustable chin strap that will keep it on your head and not get blown away by the wind. It also has a unique built in map pocket. This boonie hat comes with just four basic colors, out of which none is camo themed, yet at the same time is tactical. So, you will only buy this boonie hat if you require a more comfortable material mix, meaning that it is a single mix of 100% cotton. The great and awful can mainly be ascribed to this material. The 100% Cotton employs a more breathable material blend, such that you will not sweat to such an extent. However, it is bounty absorbent and douses up all your sweats easily. This hat requires less maintenance as you can simply toss it in the washing machine alongside whatever is left of your closet. Related: if you want a convenient hat care kit, then you can check out the Bickmore Dark Hat Care Kit. This kit contains ultra-x dark hat cleaner, stain repellant, cleaning brush and a pamphlet on how to take care of your hat. Specific features: 60% cotton + 40% polyester, UPF 50 sun protection, 4 vent holes, side eyelids and pop-in button, super light, fully flexible, quick dry, foldable. Description: The Tactical Head Wear Boonie is made of 60% Cotton + 40% Polyester. It has UPF 50 Sun Protection which blocks out 98% of harmful UVA (Ultraviolet-A) and UVB (Ultraviolet-B) rays. UVA and UVB are part of the energy that comes from the sun that can burn the skin, and can cause skin cancer. Needles to say is that with such sun protection ratings, this hat provides excellent skin protection. Additionally, this hat is designed to have 4 vent holes that can keep your head cool and can keep the sweat from dripping in your eyes. It also has quick dry properties which means that even if this hat takes a dip with you, it will be dry out very quickly. Furthermore, it is super light, fully flexible, and foldable, making it very convenient to take it anywhere. If you are thinking about where to begin when purchasing a boonie hat, we believe that you’ve found the our buying guide and reviews useful. Each of these attractive and highly durable Boonie hats offers incredible protection from the sun, while allowing your scalp to breathe. Furthermore, they provide a secure fit to ensure that even in the blazing sunny day, you will still experience the maximum shade. Columbia Sportswear Bora Bora Booney Sun Hat is the most recommended one by many users because it was designed to fit almost all head sizes. Thanks to its Nylon constructions that won’t easily shrink if it gets wet and helps retain its shape even if it is accidentally sat on. So, if you think that this, or maybe some other model is the perfect one for you, then our mission is a success! On the other hand, if you think we have left out any of the great products out there, please let us know in the comments section below.